Alain Echenay discusses the wide variety of activities of the Friends of the Museum of printing and graphic communication in Lyon (France), the association of which he has been president for a number of years. ‘Friends of the such-and-such museum’. A mention of this kind often appears in small print on the catalogues, posters and other communications of a museum. What does it signify? A mere courtesy? The possibility of admission at a reduced price? Such groups of volunteers exist everywhere in France, inspired by enthusiasm for ‘their’ institution; supporters who want to be involved in the action. What motivates them is not the few benefits granted in exchange for the membership fee, but the opportunity to militate in favour of culture and heritage! The Museum of Printing in Lyon was founded in 1964 by a printer, Maurice Audin, following on from the achievements of his father Marius, a well-known historian of printing, and supported by his brother Amable, founder of the Gallo-Roman museum, also in Lyon. The association of the Friends of the museum, les Amis du Musée de l’imprimerie (AMIL) was born in 1971 and for some time consisted largely of printers and graphic arts professionals. Over the years the range of its activities has broadened out, in close collaboration with the Museum’s management and professionals. the addition of ‘graphic communication’ to the Museum’s title is indicative of a major structural evolution. The membership of AMIL reflects this evolution: fewer professionals, more amateurs (in the positive sense of the term), more collectors. Discussions at the association’s weekly forums and steering committee meetings are enriched by this diversity. From the very start, the Association has been called upon to contribute towards certain of the Museum’s expenses: exhibitions, acquisitions, transport of objects, publications, etc. AMIL’s funding comes from two sources: membership fees and gifts. In effect we have become collectors of contributions from private individuals and from sponsors in the world of printing and elsewhere. The ongoing decline of public funding is forcing the Museum to perform feats of acrobatics and AMIL needs to keep a close eye on its needs. At present the association’s financial contribution averages 5,000 € per annum. Leaving aside the value of donated objects, we are consistently one of the major donors. The association’s support is across the board; a variety of activities rather than spectacular, heavily publicised scoops. While the Museum’s staff have the necessary skills to perform these activities, their workloads limit their capacity to undertake them. We supplement the personnel, working alongside them; for example in setting up jointly a committee to decide whether to accept or refuse objects proposed for donation via AMIL. Let us look at some noteworthy achievements. We keep a regular watch on auction sales, catalogues, antique dealers, etc. Our meetings usually start with discussion of our ‘discoveries’. The aim is to identify objects which are rare, in good condition, with a story to tell and not already present in public libraries in the region. The management of the Museum consults with experts to validate or otherwise our suggestions. 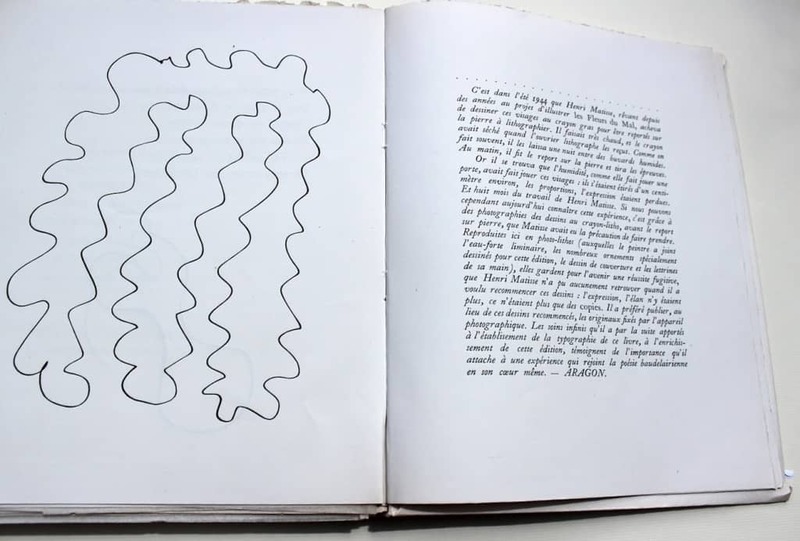 Such was the case with this copy of Les fleurs du mal illustrated by Matisse, in perfect condition (1947, numbered copy 174/320, with a dedication to the director of the Mobilier national). We responded to an appeal by the Director of the Museum in which he regretted that there were no twentieth century artists’ books in the collections. We immediately leaped into action and made the purchase. For the sake of interest, let me say a bit more about the history of this ‘rescued book’. Matisse always admired Baudelaire and had illustrated his work on several occasions. The Fleurs du Mal represented a challenge but he hesitated. When he made the acquaintance of Louis Aragon and Elsa Triolet they encouraged him to take the plunge, even undertaking to ensure publication. The artist chose the poems he wished to include, avoiding the most ‘blue’ ones, and made his drawings. It was a hot summer and the lithographer wrapped them in damp paper… everything stuck together. Impossible to make prints. Fortunately, Matisse had had photographs taken and so we have photo-lithos instead of lithos printed directly from the artist’s drawings on stone. Aragon explains this in a note at the end of the book. A facsimile edition was published in 2016. The book incorporates 33 original photos-lithos, an etching and 69 line-drawings (initials, tailpieces…). A couple from among our ‘treasure seekers’ found on a bric-a-brac stall a superb chromolithograph (19 passes!) of 1840, produced for the 400th anniversary of Gutenberg’s invention of printing. and entitled Typographia jubilans 1840. In the end the seller chose to donate it to the Museum and to document it we subsequently purchased a book entitled J. B. Hirschfeld. Hundert Jahre einer Leipziger Buchdruckerei which had been written to commemorate the century of activity of the firm of J. B. Hirschfeld, the printers of the chromolithograph; the book describes the picture and how it was produced. Let us also mention among our purchases a set of nineteen plates by Alois Senefelder, the inventor of lithography; another example is a book describing the printing firm Paul Dupont to which the Empress Eugénie, wife of Napoléon III, made a visit. This richly bound work was presented to her and in return she made a generous gift. In a different field, that of the promotion of local heritage, we undertook research into the sites of the premises of some of the printers in Lyon at the time of the Renaissance. The buildings have mostly disappeared, street-names have changed and so on, but we identified the places where we wished to affix stone plaques to complement some already in place (Etienne Dolet, Horace Cardon, Guillaume Rouillé…). The task was long and complex since we had to identify the occupants and seek their agreement, request the authorisations of the municipality, of the architects responsible for ancient monuments, of the Ministry of Culture…this is a UNESCO World Heritage site. The whole operation took seven years. 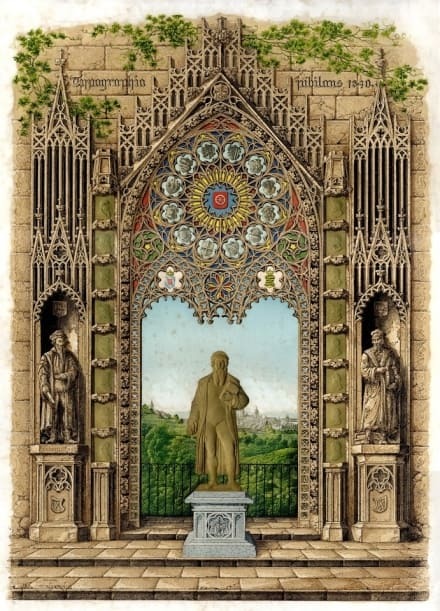 A Printers’ Trail including the de Tournes, Sébastien Gryphe, the La Porte family, Aimé De La Roche, Mathieu Husz, was conceived and presented to visitors in the form of a brochure. The stone plaques were the work of the calligrapher and stone-cutter Roger Gorrindo who works regularly with the Musée. 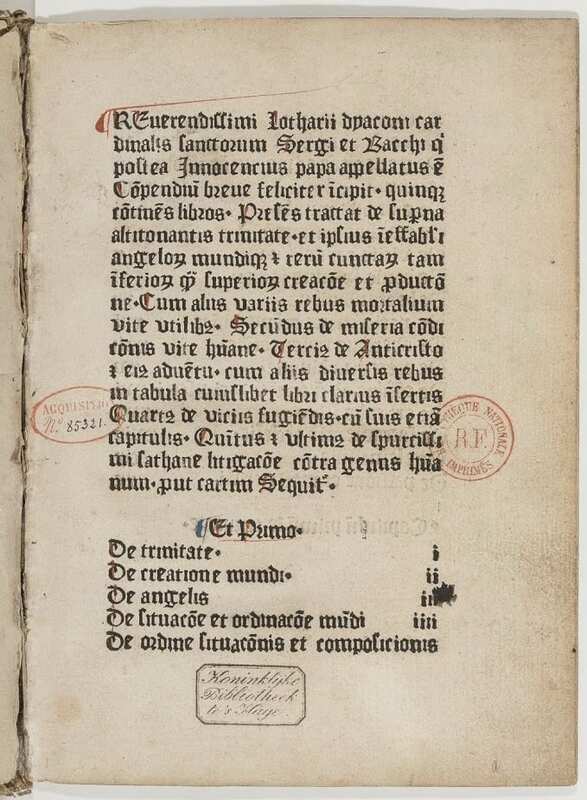 On the same subject, members have written two works about printers in Lyon at the Renaissance: the first in a pocket edition, the second more comprehensive and bilingual, in collaboration with a specialist editor in Lyon. Recognising that a visitor to the Museum may need detailed technical explanations, we commissioned a photographer to produce six videos with the help of the Museum’s professionals: one on each of the topics Linotype, casting type, woodcarving and etching, plus two on lithography. AMIL arranges eight free lectures per year on a wide variety of topics related to printing and graphic design. Given by leading specialists, they attract an audience of 70 to 100 each month and are recorded and made available on the website of the Municipal Archives where the lectures take place (since the Museum does not have a suitable hall). Over the past two years, for example, topics have included 19th century illustrated book-covers, posters in the Toulouse museum, printing for the blind, the ‘Trévous dictionary’, etc. The Friends’ contribution is not limited to finance and logistics. They also provide additional brainpower. In 2014, in connection with major overhaul of the permanent collection, two native English speakers translated all the new panels and labels; a significant piece of work not only in terms of volume but also because of the constraints involved in an exercise of this kind. These documents will often be read by visitors whose mother-tongue is not English, so the translation must be very clear and easily understandable. Many comments by visitors confirm that the exercise was successful and the work goes on, with temporary exhibitions also having the benefit of bilingual labels, much appreciated by the large number of foreign visitors to the Museum. The Friends’ contribution even extends to specialised bibliographical research. Copies of the first book that can be dated with certainty as printed in Lyon (in 1473) are held in six European libraries (London, Manchester, Turin, Paris, Niort, Grenoble) but there is not one in Lyon. The Compendium Breve, ascribed to the future Pope Innocent III, consists of a number of religious texts and enjoyed considerable success. One of the Friends embarked on a very detailed study of the work: typography, page layout, binding, various anomalies that occurred during printing. Comparisons between the various copies were made, consulting either the originals or high-definition scans. Cataloguing, sorting and sometimes finding a gem! That is what a team of Friends do, every week, in the Museum’s reserves. In support of the Museum’s personnel, our Friends immerse themselves in an incredible mass of documents which have not yet been catalogued or only partially so: for example the René Ponot collection with its 50 metres of shelving filled with filing-boxes each holding hundreds of documents ; the 3,000 ex-libris given by a Lyon art dealer and collector; posters from the 1960s and 1970s given to the Museum by a graphic artist and collector who, thirty years later, has become a faithful member of the Friends; as a final example the myriad of papers left by the founder of the Museum, Maurice Audin. At our weekly meeting a dozen of us take stock of work in progress, projects, discoveries and so on. The Director frequently joins us to tell us what is happening in the Museum and its world; he updates us on present and future activities, openly and without waffle, and we respond in the same way. A high spot of our meetings. We of course organise guided tours of all the exhibitions at the Museum for our members; we also arrange visits to other institutions with links to printing and the graphic arts, for example the Lyon Municipal Library where we regularly take advantage of presentations by their experts of rare and beautiful works held in their reserves. Along the same lines we have offered our members visits to the Municipal and Departmental Archives and to specialist libraries in Lyon. However, the outings which we arrange are not limited to Lyon. We have made many excellent trips by coach, to the Gutenberg Museum in Fribourg, to the Champollion Museum in Figeac (with a stop at Conques), to the Inguimbertine Library in Carpentras (where we also visited the oldest synagogue in France), to the National Centre for theatre costume in Moulins, to the Bodmer Collection in Geneva. Members of the Museum’s personnel have joined us for some of these excursions, which provide a good opportunity to cement relations between Friends and staff. We undertake a wide variety of activities which, seen from the outside, are not spectacular. Zooming in on what happens inside, the synergy is impressive: mutual respect for each other’s role, a democratically functioning association… to which the Director of the Museum belongs as of right and of which he is an active member. The institution has its working practices and it is not for us to interfere with its scientific and administrative procedures! Over the years, despite changes of management on both sides, a common culture has been created, with a great sense of mutual confidence. Our Directors understand the value of their association of Friends: representative of the wider public, strong cultural added value, many former researchers, teachers, businessmen… who listen attentively to the Museum’s staff and management. The Director can talk about his plans, express himself freely, benefit from an irreplaceable ‘mirror effect’. But all of this would not have been possible without open-mindedness and goodwill from throughout the organisation.